And here, I came out with my newly created wrap recipe, for my mother, your mother, you and me! Of course, fathers and sons were not missed. Everyone loved this wrap so much! Each of them had two large rolls which required using 2 wraps for each roll they had! Prepare spicy pork: Clean and pat dry pork belly. Sprinkle salt and pepper. Mix all other seasonings in a bowl. Coat meat well with seasoning mixture. Marinate for an hour. Heat frying pan with oil over medium fire. Take pork belly out from seasoning sauce, and place in frying pan to sauté until both sides are browned. Reduce heat to low, pour in seasoning sauce and simmer until sauce is thicken and drying up. Heat off and transfer to a plate to cool. Shred pork with a fork. Reserve for later. Prepare asparagus mushroom: Heat wok with oil over medium fire. Add asparagus and stir to cook. Sprinkle salt and pepper, continue to cook until almost softened. Add mushrooms, stir fry. Drizzle light soy sauce (sizzling effect), and stir to combine. Heat off. Reserve for later. Prepare scramble egg: Beat eggs. Add milk to combine well. Heat pan with oil and butter over low fire. Pour beaten egg mixture, and immediately scramble the egg once it starts to set. Keep stirring to retain its moisture while letting it set gradually. Heat off. Set aside. When ready to serve: Spread thin layer of butter on heated frying pan over low fire. Place and warm Mission wrap on both sides. I used Mission original wrap. You may choose 6-grain wrap, and others. 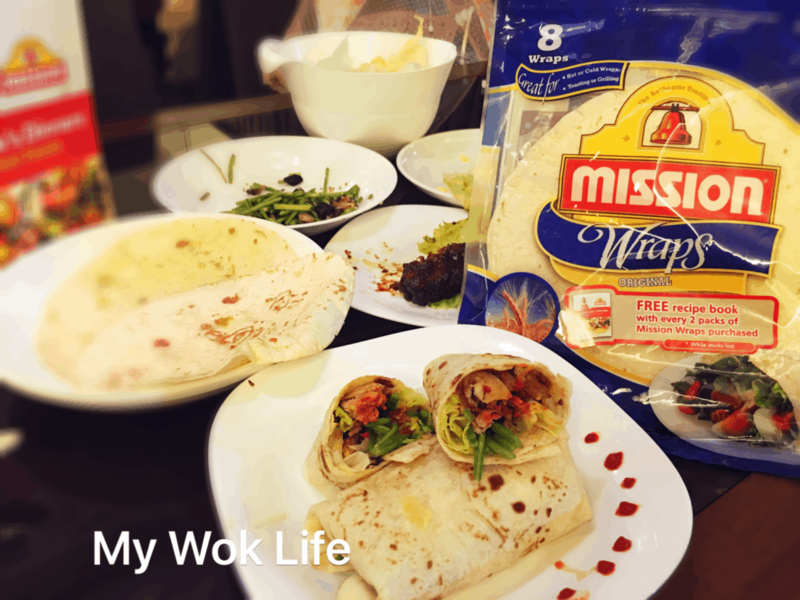 Mission Foods wraps are available at major supermarkets eg NTUC Fairprice and Cold Storage. Sriracha hot sauce is known as a kind of Thai chili sauce. 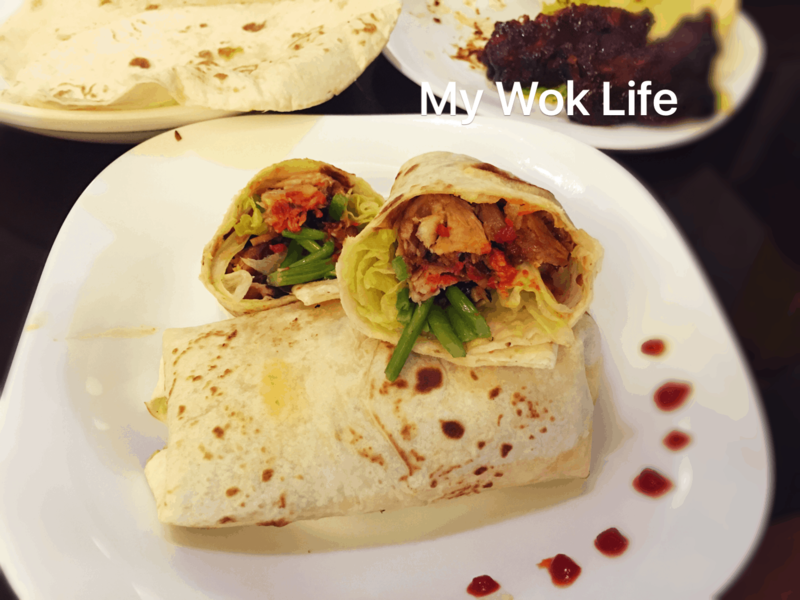 The hot spicy flavor is savory and pleasant to taste and goes so well with this wrap roll, if you liked hot flavor.